Temporary lighting is a major cost across all jobsites. From the type of temp lighting used, power consumption, and repair and replacement rates, the installation and maintenance of high bay lights could send cost soaring. Due to temporary lighting being mandated by OSHA, this cost cannot be avoided, but total cost can be decreased. 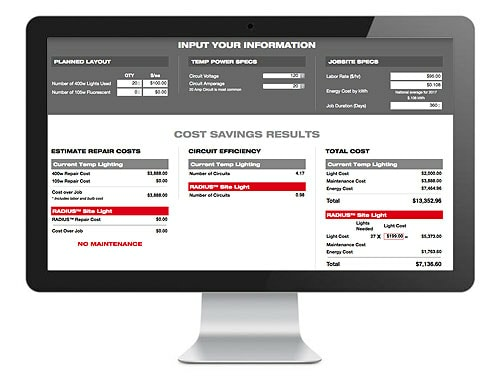 Find savings opportunities for your jobsite that could help save thousands. Congratulations, use this link to access the temp lighting calculator: Temp Lighting Cost Calculator Tool!